When the perfect conditions exist, and the sky is perfection itself, it seems to acquire a life of its own: a vivacity which looks almost living. That blue has eluded the greatest artists. Imprison it within a frame and it so often loses its spirit. There is, however, a notable way of catching it and trapping it, like Tinkerbell in a jar, on a piece of manuscript. If you were a monk in the fourteenth century you would know how to trap the sky on a page. First, befriend traders who travel to the rim of the known world: to Badakhshan in Afghanistan, a lifetime away. There, since the third millennium BC, they have been mining a rock of extraordinary rarity and stunning beauty. It is called in Latin and persian lapis lazuli – sky stone – and it enchanted Egypt before the Pharaohs came to their grandiose thrones, and was found as tiny beads at neolithic burial sites in the Caucasus and Mauritania, honouring ancient dead. The Afghan mine – Sar-e-Sang – supplied the Mesapotamians and Egyptians, the Greeks and Romans. It was the blue of the Egyptian scarab beetle and of Queen Cleopatra’s eyeshadow. So you can imagine that with one mine supplying so many for six thousand years, the price of this mineral must be high indeed. And you would be right. In mediaeval times lapis lazuli was more expensive than gold. Though it must be owned that monasteries, as a rule, were not poor places. So they would purchase some lapis lazuli at great expense. But the toil did not end there: for the rocks were impure, with veins of calc-spar and iron pyrites in the mix. According to A Baker’s Common Mediaeval Pigments, The monks would grind the rock to a powder and mix it with a concoction of pine resin, wax or linseed oil which had been boiled up together. The whole was mixed with lye, a corrosive alkaline substance obtained from hardwood ashes. Eventually, you could extract the blue colour: the purest in the first batch, which fetched the highest price. This pure blue mineral, ground to subdue the sky to a page, has a special gift. It carries a radical ion in its makeup: a charge flits between sulphur atoms to create the blue. 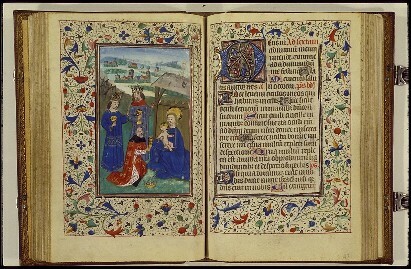 Vivid, deep, almost alive, the colour dwarfs all others in the manuscripts the monks illustrated. It had another property, those monks would tell you: for lapis lazuli was a cure for melancholy. In 1935, one poet gave another poet a gift in a pub in Dublin. Harry Clifton had come upon a lapis lazuli frieze from China. And he gifted it to William Butler Yeats. It depicted three monks climbing a mountain to a temple, a bird flying overhead: and all in that impudent blue, the calm front to an atomic tempest beneath. He loved it: and what he loved he wrote about, there in the years before World War II began, when the women of Dublin were looking not for men of art but for men of action who would protect them from zeppelins and planes bearing bombs. But Yeats runs his fingers over the lapis lazuli and weaves a story about the two men and their servants who are not climbing to a temple, but to a pub; to survey the mountains from high up, and see clearly what those in the valleys cannot see. And they, with an ancient wisdom borne of art, transcend the tragedy. It’s all supposition and storytelling, of course. It’s just a stone. But a stone which seems to draw the eyes of mankind inexorably to its deep, vivid blue. Posted in WhimsyTagged blue, illuminated manuscripts, lapis lazuli, monasteries, Side View's Theme, William Butler YeatsBookmark the permalink. Lovely emotion complementing the beautiful blue sky framed in my window. What an absolutely beautiful post. I love that notion of sky! That about lapis lazuli is very illuminating. Wow, a rich haul today, Karen: I too am a huge fan of turquoise. And like you, my mother in law collected blue glass: to the point where she decorated a white room in which to house it all….we called it the Blue Room. Thank you: I had not even thought about cobalt. We’ve got a bit of that going on over here this morning. The animated quality of the sky has always enchanted me — perhaps why so many of my photographs have it as both subject and background. My sauntering sojourns found me face to face with texts of the sort you’ve included in your image above — well, separated by protective glass, of course — that give rise to questions of color origins and, as you’ve noted beautifully, the (perhaps disappointing) transformation that occurs when one tries to “trap” or “use” color for, say, an ancient illustrated text. That being said, the monkish blue is heavenly indeed. An apt post for the season, as the peculiar and particular brand of autumn blue is starting to appear overhead, making the cityscapes seem perhaps truer than they really are. You caught such a beautiful sky in those pictures over the Hudson, Sabonseine. More soft oranges and peaches, but I don;t hink I’ll forget that vision of what is a busy and important river. I love to look at the old manuscripts. so much detail through an ancient lens. I always thought purple was the color of royalty. But the price of this “lapis lazuli” is very high. So, maybe, that should be the royal color. Not lapis lazuli, but don’t we all feel good when the sky is blue and cloudless? I love Yeats. I’d forgotten this poem, not read it since I don’t know when. Thanks for the reminder, and for the enjoyable post. Pleasure, Myfanwy. The sky was cloudy today and I did miss those clear blue skies we have been having! Never mind. to everything there is a season. That’s something I forget about, that certain colors were not really able to be replicated easily in paint or dye. Lapis must have been so sought after, as were blue paints and dyes. I remember being so surprised when I read that the color mauve wasn’t really “invented” as a paint color until the 19th century. I have a friend who dyes wool using the old vegetable dyes, Weebles: such a limited range of greens and browns and yellows. No wonder the blue caused such a storm! A very important colour that blue of the gem of the night sky, the soul that lives within ultramarine. You did it justice. The reasons you outlined am sure influenced the 17th century craftsman in Cuba who created the tile in my blog header. As soon as seen that blue circle within the labyrinth on the tile I knew it was worth a picture at the very least. It’s a gorgeous colour: and I’m not surprised that 17th century craftsman chose it, Hudson. What is it about blue that makes it the color of poetry? I wish I knew, because I love it, too. I have no idea. I used to hate blue because it was so…level-headed. But lapis makes a light-headedness which draws me back. Thanks, Debra! I shall also look at lapis in a new way: one day I’d love to visit that mine…. The mystery of brilliant, deep blue on the page illuminated by Kate 🙂 That exquisite blue does stand out and set off the red so well in those wonderful old manuscripts. It does, doesn’t it, BB? I adore poring over these old manuscripts. Such beauty, and complexity, and time. There is. You have several backed up, I feel 😀 Like a reading list! how lovely! you’re such a profound writer — i really enjoy your insights. fresh and always pretty.